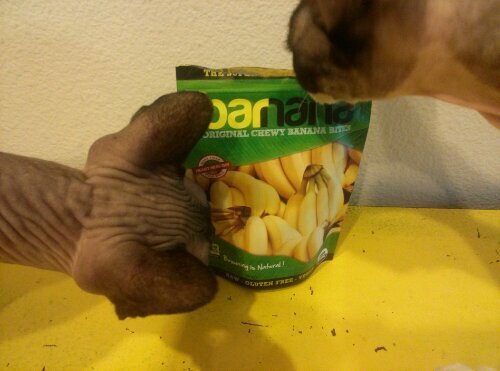 Vegan MoFo 2013: 13 Barnana Review & Giveaway! I have something really great to share with you… a review & a chance for you to win a sample of your very own! 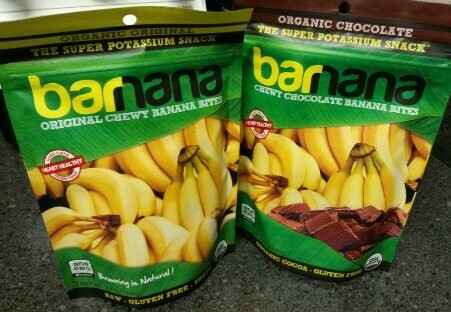 I was recently contacted by VeganCuts & Barnana to check out these banana bites that will be soon be shipping out in your September VeganCuts snack boxes. 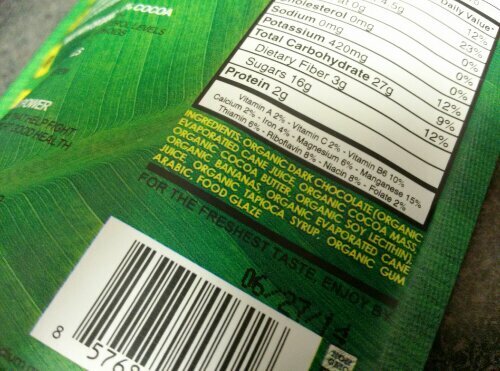 Ingredients for the chocolate. Food glaze, not vegan. Co-founder, Nik, got a hold of me prior to my receiving the shipment to let me know that only the Original product is vegan: “the Original product is 100% Vegan, however the chocolate covered one has natural glaze (like honey) so it’s not 100% vegan“. He did assure me, however, in a second email that the “chocolate is vegetarian“, so I can only comment on the former, as the latter will be going to Thomas. Though I’m still not really sure what the non-vegan “like honey” mystery ingredient is in the chocolate, the original only has one ingredient… and I’m betting you can guess what it is! The original is also organic, raw, and gluten-free. 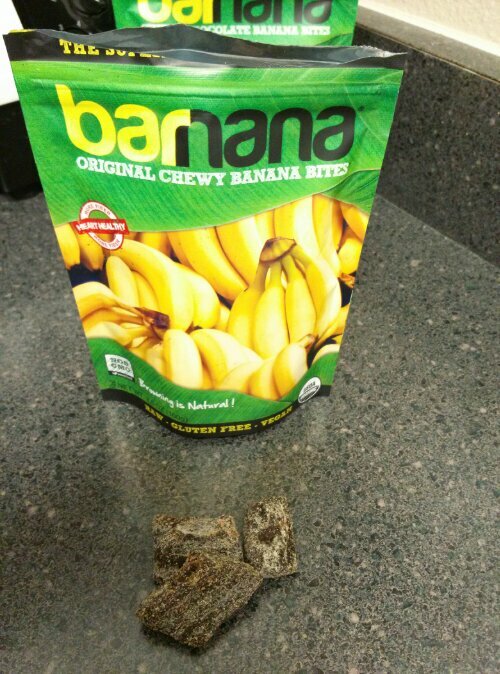 Barnana is the “original chewy banana bite”, and to me, is really like banana jerky. Sure we’ve all had those dehydrated banana chips before, but these are different. Dense and chewy, as well as dark and rich, like you’d expect a very ripe banana to be. I’m generally the type of person who likes to eat bananas fairly close to green. I’ll eat them with just a little bit of spottiness, but anything beyond that, and they’re peeled, halved, and frozen for green smoothies. So you’ll understand that it took me two tastings to decided if I really liked them or not. Turns out that I did. I decided that these would be great chopped up and thrown into the home made trail mix combos I’m fond of carrying everywhere in old salsa jars. I also thought these might be a good addition to banana bread or muffins if chopped up finely, kind of like candied ginger pieces are in similar baked goods. Or sprinkled on ice cream. Or with raw banana ice cream! Midna & Ganon are always ready to get involved in the review process. Those of you who get the VeganCuts snack box will be getting to try these for yourselves soon enough, but if you don’t, here’s your chance to grab some gratis! Just follow this link a Rafflecopter giveaway to enter for your chance to win! Don’t forget to comment below and share this post for extra chances to win. Please note that the samples you will receive will be the same as the ones above, that being 1 vegan pack, and 1 non-vegan pack of Barnana treats. Raffle ends Sunday night, at midnight pacific time, and the Rafflecopter selected winner will be contacted promptly thereafter. Happy last [full] week of Mofo!